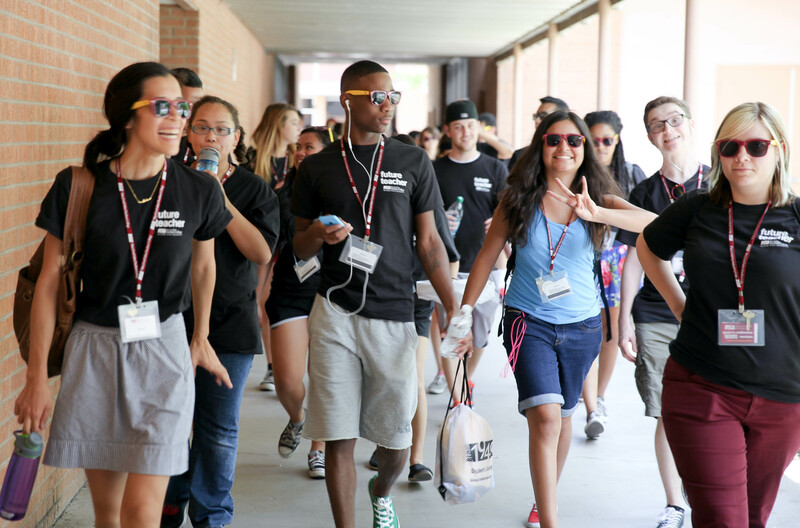 For one week each summer at Arizona State University’s Polytechnic campus, high school students from around the nation come together to learn what it takes to be a teacher at the Hunnicutt Future Educators Academy. In June of 2014, more than 30 students participated in the overnight camp hosted by Mary Lou Fulton Teachers College – many on scholarship. A total of $5,000 in funding was made available this year to qualified Hunnicutt participants by Teachers College’s Office of the Dean. Ferguson was one of about 20 students who received full or partial funding to attend the academy, which typically costs nearly $400 per person. “It’s nice to help someone who wouldn’t otherwise have had that opportunity,” said Corey Stevenson, a student recruitment coordinator senior in Teachers College who helps lead the camp experience. While scholarship consideration is given to students from both in- and out-of-state, it is particularly helpful for those students who also may incur travel expenses to attend. This year, out-of-state Hunnicutt participants traveled to the Phoenix area from Nevada, California, Ohio and Illinois. “No matter where these students are from, or what their background, when they all get together, they’re just kids and care about the same things,” Stevenson said. Aside from simply hanging out and having fun, for Ferguson, that meant touring the ASU athletics’ facilities on the Tempe campus and hearing from current faculty and students about what it means to be in college and major in education. He expressed particular excitement over the high employment rate for Teachers College alumni. An ASU exit survey of 2012-2013 graduates found that 93 percent of Teachers College undergraduate students pursuing jobs were employed or had at least one job offer 90 days after graduation. A new business venture based on technology developed by ASU biomedical engineers has earned support from Arizona's economic development agency and other entrepreneurship backers. EndoVantage is one of six ventures to receive an Arizona Innovation Challenge award so far this year from among 135 applicants. The startup was also recently selected to receive support from ASU’s Edson Student Entrepreneur Initiative – $20,000 in seed funding, along with office space and other resources at SkySong, The ASU Scottsdale Innovation Center, and mentoring from business experts. In addition, the venture was accepted into IBM’s Softlayer Incubator, which is providing mentoring in software engineering and business-related services. 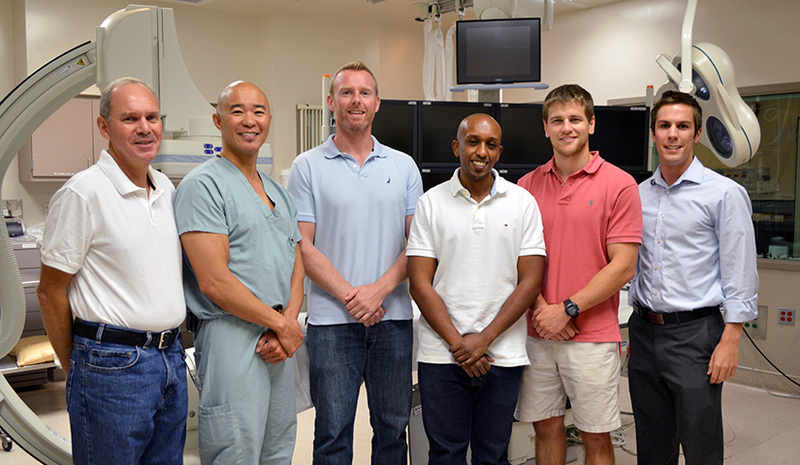 David Frakes and Haithem Babiker invented the EndoVantage technology platform in ASU’s Image Processing Applications Laboratory with help from Brian Chong, a physician at Mayo Clinic Hospital in Phoenix. Frakes is the chief science office for EndoVantage. He is an associate professor in the School of Biological and Health Systems Engineering, and in the School of Electrical, Computer and Energy Engineering, two of ASU’s Ira A. Fulton Schools of Engineering. Babiker is the chief technology officer. He is a postdoctoral research associate in the School of Biological and Health Systems Engineering. Justin Ryan, a biomedical engineering doctoral student working in Frakes’ lab, is contributing to EndoVantage by providing 3-D virtual modeling of blood vessels.